The original Star Wars Battlefront, developed by Pandemic Studios, was one of my favorite games on the PlayStation 2 in 2004. My friend and I spent countless weekends firing blasters and clashing lightsabers against each other, reenacting battles from our favorite space fantasy franchise. That cycle continued one year later with its sequel, Star Wars: Battlefront II. 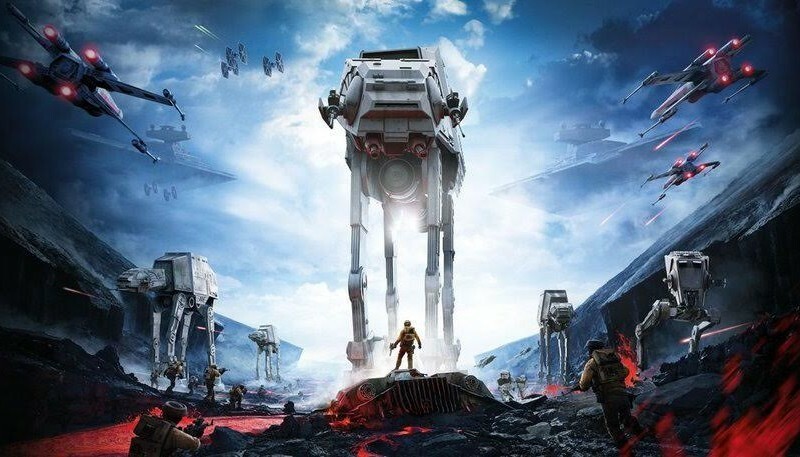 When Pandemic closed their doors in 2009, I wasn’t sure if the passionate fans of the series would ever see another Battlefront—that is, until E3 2013, when DICE announced the Star Wars Battlefront series’ next entry utilizing the Frostbite 3 engine. That news obviously excited me, but I didn’t want to make judgement until Star Wars Battlefront was in my hands. Fortunately, this weekend provided a sampling of what’s to come with the open beta that ran Oct. 8-13—and it looks like it may be worth the wait to Nov. 17. The first thing to catch my attention was the party and friends list interface at the top of the screen. If there’s one thing DICE does well, it’s building solid architecture for friends to play together—Battlefield 4 notwithstanding. You can invite your party on the fly, check your buddy’s Star Wars Battlefront stats, and even “pick a partner,” something similar to the Battlefield squad system. I don’t see why four-member squads dissolved into only two players, but it’s a minor gripe overall. As the host, you bring your buddy—and usually the rest of your party—along whichever mode you choose, so long as the mode caters to your party’s size. 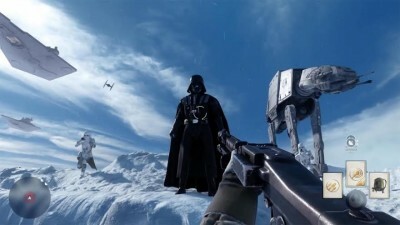 While in a game you have the option to spawn on your buddy, assuming, of course, an AT-AT hasn’t stomped their body into the snow or Luke Skywalker hasn’t sliced them to ribbons with his lightsaber. Oh yeah, you can play as iconic heroes and villains from the series. Find a token on the map when it appears and activate it to control some of the coolest characters in Star Wars history. The beta limits access to the Walker Assault mission on the planet Hoth, with Luke Skywalker available to the Rebels and Darth Vader to the Imperial troops. The full game promises more characters, such as (my personal favorite) Boba Fett. One reddit user mined some data on the PC version, discovering references to Princess Leia, Han Solo, and the Emperor. I’m excited to see who else enters the fight, though I won’t hold out hope for the chance to play Jabba the Hutt or Wicket the Ewok. There were three total modes available in the Star Wars Battlefront beta. First off, there’s Drop Zone, a king-of-the-hill mode that pits two teams of eight against each other while capturing and protecting semi-randomized escape pods. The first two days felt one-sided, with the final capture score typically 5–0, regardless of whether you played as an Imperial stormtrooper or Rebel fighter. As more and more people became proficient with the game that number rounded out more often than not. What kind of scenario would you say we’re in, Admiral Ackbar? The other competitive multiplayer mode available was Walker Assault, an epic 20 vs 20 battle recreating the battle on the planet Hoth, as seen in a little-known film from 1980 titled The Empire Strikes Back. Here you can even test out the hero and villain at the heart of the series, Jedi knight Luke Skywalker and Dark Lord of the Sith, Darth Vader. Their presence can definitely change the tide of battle, so long as they exercise a bit of caution. It’s ridiculously fun, if not somewhat unbalanced—in the tens of hours I’ve played in that mode, I only won twice as the Rebels. Now, part of that is general team familiarity with the tasks at hand activating and protecting the satellite uplinks, but the steep angle of that uphill battle is beyond an unfair advantage. Hopefully the various unlockable upgrades available at launch will combat this issue, but I hope they tweak all the appropriate numbers to even the playing field. 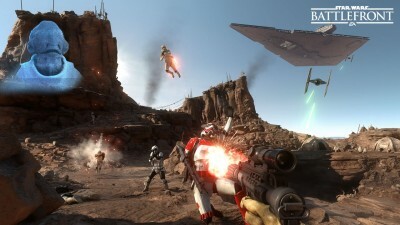 The single-player or cooperative Survival mission takes place on Tatooine, as you fight off increasingly difficult waves of stormtroopers, AT-STs and more moving on your position—not unlike Gears of War’s Horde. The beta capped it at the six waves, though the retail version extends to 15 waves on at least four different maps. I really enjoy seeing split-screen co-op hasn’t disappeared completely, as it fits perfectly in this type of game type. With seven different competitive multiplayer modes, a 15-wave Survival mode on four different maps, and more to be revealed, I’m undoubtedly excited for the release of Star Wars Battlefront on Nov. 17. From what I’ve played so far, this game is shaping up to be the ultimate Star Wars fanservice video game. Given the debacle that was Battlefield 4, I still hold a healthy dose of skepticism for the final product, but there certainly isn’t a disturbing lack of faith. It’s jaw-droppingly gorgeous, the gameplay mechanics are equally fluid, and the sheer geekasms I get moment to moment check that “Star Wars fantasy-fulfillment” box just in the limited access I had—this feels like a proper Star Wars game. Here’s to hoping DICE doesn’t disappoint.